My Hubby and I switched to linen sheets about 17 years ago. We haven't looked back. Slowly we collected so that we have enough. Why you ask? 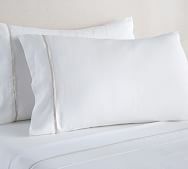 Well, I got frustrated with the way cotton sheets, regardless of how many "threads" they had would just get dirty as Hubby sweats a good deal through his head at night. It's true. He ruined pillowcases. Then, the whole sheet started to get "yucky" no matter how much I paid. Now, linen, it requires little to no pesticides or chemicals in the making (so I have been told), they are naturally antibiotic, and best of all repel dirt. They breathe so much better so "sweaty" is less of an issue. Linen sheets last longer than cotton sheets. Today, I thought I'd give you some suggestions on where to buy and what I recently discovered. In the past, I trolled through Ebay for happy chances to find French linen sheets and have been happy with what I did get...You can find some that are beautifully monogrammed, lacey and drool worthy. Many times they will be odd sizes for US beds...so be aware of that. It will taking measuring and patience. However, they will be soft and lovely. I have purchased from Linoto...and Jason is so helpful. These are lovely sheets. They have many colors....(not all linen sheets are white). I have purchased from Williams Sonoma...they were ok, but the quality wasn't as good as I would have expected. They were not as delicious as I'd expect,(this was several years ago...perhaps they are now better). 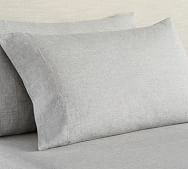 I have purchased linen from fabric stores online, in order to create linen pillowcases. The linen has been great...I still have those pillowcases...a little more "rustic" in weave. 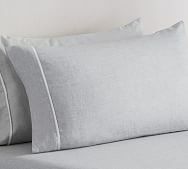 I have even gotten a good deal from TJMaxx homestore, in the clearance aisle...a whole set for $60...yes please....It turned out to be a brownish color...but who cares...The top sheet turned out to be a king size...but oh well. I have found vintage pillowcases at thrift stores...lovely monogrammed ones like from Ebay. These were the real deal, super soft older linen pillowcases and shams. 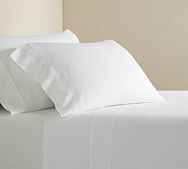 So, all that said, I recently (well several months ago) purchased some Belgian Flax Linen sheets from Pottery Barn. They were one of those deals that caught my eye. Not $60 like at TJ Maxx. But what I have paid for one sheet for a whole set. What??? So, I ordered. Months went by. I went to our store to find out why it was going to take so long. Apparently, it was such a popular sale, it took them by surprise...and their stock just wasn't there. Ugh. 4 months went by and they arrived, just a few days ago. Hubby got into bed and noticed! They are prewashed super soft and overall yummy sheets! Pottery Barn now has a few colors....but they are scrumptious. These are the pictures from online. .. I did pick white with the little band on them...but I imagine they would all be so lovely. When you wash them....I hope you can hang them outside in the sun...oh how linen sheets sparkle after hanging in the sun. They smell divine. And, if you hang them carefully, you can take them off the line and fold...its just like someone ironed them. I have seen many linen vendors from Belarus ( and similar countries) on Etsy, and have not tried buying from them. I imagine their quality is fine, perhaps, but I haven't tried. I figured that the cost of shipping and time wasn't really what I wanted to spend. 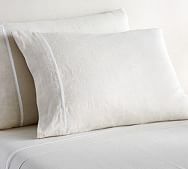 Regardless of where you buy, rustic or Belgian Flax (which I now think is the best of best)...linen is so good. Perfect for a house that is going less chemical. They are just better. This is really interesting -- I never thought of linen sheets but I know what you mean about how pillowcases can get discolored. It sounds very interesting, and well worth checking out. Thanks for your recommendations. If you have been reading the blog, you know what happens when you spray Lysol on Oil Rubbed Bronze door handles. Yeah, not pretty. And, a very expensive mistake...or at least it can be. It basically just takes the finish off! I need to sew, something everyday, or I get grumpy! I found a cross stitch panel that someone had done, and fell in love with it. It's actually a covered bridge, but it looks kinda like a barn...so I took it home, no idea at all what to do with it. Today, it hit me....a pillow! When I went to the closet, I found a pillow form....sweet!! Love to sew, garden and paint with chalk paint!